Charles Edward Spracklin was a son of Daniel and Sarah Spracklin. He was born the 19th of September, 1874 in Benton Co., Iowa according to my records; however, his Death Certificate gives 1873 as his birth year. Charles Edward or Ed as I think he was called, lived in Benton County, Iowa with his parents and migrated with them to Iowa County, Iowa. He remained with his parents up to about 1905. He is featured the 1885 1895, 1905 Iowa State Census which I have shared on this blog in posts about his father Daniel. He was also in the 1900 U.S. Federal Census. By 1910 he migrated up to Pine River, Cass Co., Minnesota although his obituary says he came there in 1915. He concentrated on the townships west of Pine River in the lower part of the county. He married Arminda Victoria Ward about 1915 probably in Minnesota. I do not know her father’s name but her mother was Martha Ellen Walker. There is an Arminda V. Ward living with a Jonas O. Welker and Edward C. in Bungo Twp., Cass Co., Minnesota in 1910. She is listed as his niece and age 26. She was born in Minnesota and her parents were born in Ohio. Jonas’ parents were born in Ohio and New Hampshire. He is a farmer on a general farm. I could not find her in the 1900 U.S. Census but I did find her in the 1905 Minnesota State Census as Armenda V. Ward, age 21, census date June 26, 1905, Cass County, Bungo, Minnesota, born about 1884 and above her is listed an Ora J. Welker and Edwin C. Welker. Arminda was the author of the Spracklin Family Outline featured on the Solomon Goss Blog dated August 5, 2011 titled: Ancestor Outline by Armindo Spracklin. You will see that she has different vital dates for some of the children of Daniel and Sarah, but that is not unusual in genealogy. I will make a page for this Outline that she created and publish it at the top of this blog, it is very special source given to me by my Aunt Miriam. In 1917 he is involved with the deed partitioning the land of his father Daniel Spracklin and he shares this deed with his sister Amarilla and his wife Arminda. I will present more information in a later post on these partition deeds. Charles Edward Spracklin registered for the Draft in 1918. We see that Charles writes he was born in 1875, so his birth year keeps changing. Charles Edward Spracklin, Star Route Pine River, Cass Co., Minnesota, age 43, birth 19 Sept 1875. White, Native born, occupation farming, self, Nearest Relative: Mrs. Arminda Spracklin, Star Route, Pine River, Cass, Minnesota, Medium height, medium build, eyes brown, color dark, Signed by Robert Paulsen, 12 September, 1918. Source: WWI Draft Cards: Charles Edward Spracklin, WWI Draft Card, #751, Pine River, Cass Co., Minnesota, Order#1788, 12 Sept 1918. On 10 April 1919 Charles Edward Spracklin obtained a patent for land in Minnesota. Source: Charles E. Spracklin Family, 1920 U.S. Federal Census, Walden Twp., Cass Co., Minnesota, SD#6, ED#93, Sht 2A, enumerated 26, January 1920 by B.F. Rhoades. Line 6, EM, 25, 25, Spracklin, Charles, E. head, O, M, Male, White, 45, Married, yes, yes, born Iowa, father born Ohio, mother born Indiana, yes, farmer, farm, C, 13. Abbott, Martha E. mother-in-law, 59 Widowed, yes, yes, born Ohio, Father born Ohio, mother New Hampshire. In 1928 Charles or Edward “Ed” was in the local news. I was trying to find out more about Charles Edward because it is rumored his brother Peter came to Minnesota and other events took place but I was unable to find any other news. Ed Spracklin’s team indulged in a short runaway Tuesday but before they got fully underway became entangled in a road drag and stopped after the tongue of the wagon had been broken. The wagon was loaded with two Jersey cows so it was fortunate that the road drag interfered. The team became frightened at a passing train. Source: Pine River Journal Newspaper, Pine River, MN Friday, Sept. 28, 1928. Charles and Arminda were living in Bull Moose Twp., in Cass Co., Minnesota in 1930. Line 24, [N6 /14] 6, 6, Spracklin, Charles E. Head, R, yes, M, W, 56, M, 41, No, yes, born Iowa, father born Ohio, mother Indiana, farmer, general, O, yes, No, 6. Spracklin, Arminda V. Wife, F, W, 46, M, 32, No, yes, born Minnesota. Spracklin, Ines E.daughter, F, 2, 12, S, yes, yes, born Minnesota. Spracklin, George D., son, M, W, 8, S, yes, born Minnesota. Charles and Arminda are now in McKinley Twp., Cass Co., Minnesota in 1940. They have their grandson with them and that means that Ines had died. Source: Charles E. Spracklin Family, 1940 U.S. Federal Census, McKinley Twp., Cass Co., Minnesota, SD#10, ED#11-31, Sht #1 B, enumerated on 8 April 1940, by Leslie L. Bundry. Line 47, 11, R, 1, yes, Spracklin, Charles E, Head, M,W , 65, M, No. 6, Iowa, Same place, yes, yes, 24, farmer, farm, OA, 26, yes, 9. Spracklin, Arminda V. Wife, F, W, 56, Married, No., 7, Minnesota, Same place, yes, no, no, no, no, H.
Spracklin, George D. son, M, W, 18, S, No 7, Minnesota, Same Place, no yes, 39, farm laborer, farm, CW, 52, 100, no. 1. Ines Amirilla Spracklin born 31 July, 1917 and died 28, November, 1936. She married a Henry Klinert and they had one child Charles Henry Klinert, born 8 November 1936. I am happy to say that Charles married in 1959 in Montana and he died in San Diego, California. Find A Grave has a memorial to him and his wife at the Miramar National Cemetery there. Henry, the father, was living in Bull Moose Twp., in the 1940 Census listed alone and as a widow. There is a Henry Klinert who died in 1989 in Crow Wing, Minnesota but I don’t know if it him at this time. I think Ines would be proud to know her son Charles was a highly decorated serviceman. Ines Spracklin Klinert is buried near her father in the Bethlehelm Cemetery in McKinley Twp., Cass Co., Minnesota. Find A Grave has a memorial for her. 2. George David Spracklin born 5 August, 1921 and died 4 June, 1993 in Miles City, Custer Co., Montana. He married first to Mary Josie Kastanck and had four children: David Edward, Clifford Joe, Elise Inez, Suzzy Mabel. He then remarried to a Marla Jean Fleming in Miles City, Montana and had one daughter. After 1946, George took his mother to Montana after the death of his father Charles Edward because she wanted to be buried in the mountains as the story goes. George died in Miles City, Montana on 4 June, 1993 and is buried in the Custer County Cemetery. He doesn’t have a tombstone but instead, he has a metal tag on his gravesite. I have placed a memorial at Find A Grave for him. 002190 #Death Cert. or 2490? Died in Deerfield Twp., Cass Co., Minnesota, usually resides in the same place. Was in that community 5 years. Male, white, married to Arminda who was 63 yrs old. Date of Birth for Charles was Sept. 19, 1873, age 72 yrs, 11 mos, 21 days. Occupation farmer born in Benton Co., Iowa. Father Daniel Dare Spracklin born in Ohio, mother Sarah Blackier born in Ohio. Informant was George Spracklin of Backus, Minnesota. Charles was buried at McKinley Twp. on 9/16/1946. Northland Funeral Home handled the arrangements, located in Pine River, Mn. Signed by Annie Compton on 9/19/1941, Local Registrar. He died on Sept. 19, 1946 of chronic myocarditis over 8 months. D.E. Gyres, M.D. ? of Pegquote Falls, 9/11/1946. Funeral services were held in Backus for Charles Edward Spracklin, 72 years of age, who passed away September 10th at his home in Deerfield Township. 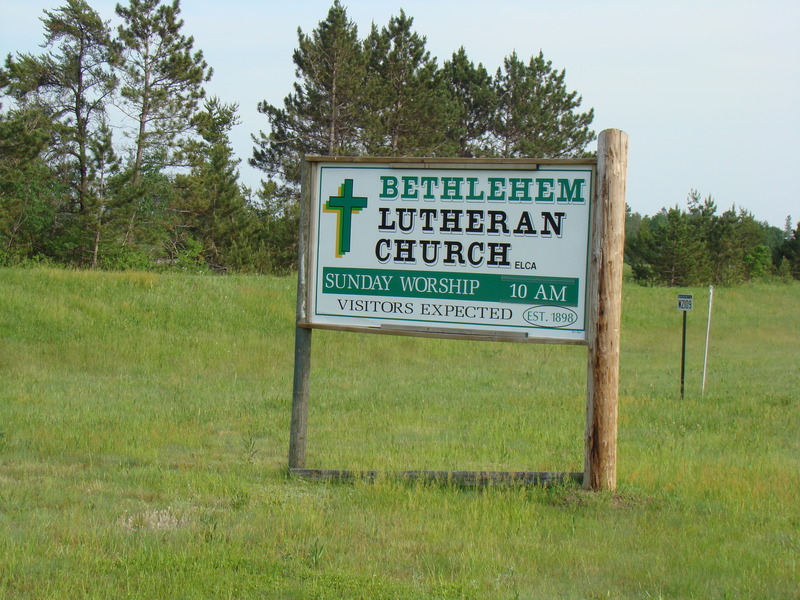 Services were held at the Backus Congregional Church with Reverend Glen Erickson officiating. Music and singing were furnished by Mrs. Erikson and Donna Culter. Pallbearers included Bill Backs, John Cunningham, Harold Roger, Ernie White, James Bishop and Melvin Ray. Internment in the Backus cemetery. A resident of Cass County for 34 years Mr. Spracklin was well known and highly respected and his many friends were saddened by the news of his death. Charles Edward Spracklin born September 19, 1874, at Benton, Iowa, and passed away September 10, 1946 at his home in Deerfield Township, Cass County, Minnesota. He had 15 brothers and five sisters, 18 of whom preceded him in death. At 18 months of age he moved with his parents to Deep River, Iowa. When he was 18 he migrated to western North Dakota and eastern Montana for a short time, then returned to Deep River, Iowa, by way of Shenandoah, Nebraska. In 1912 he came to Pine River, in 1919 he moved to Backus, where he resided until his death. During that time he made three trips to the Dakota harvest field and two to Iowa for corn picking. In 1915 he was united in marriage to Minn Armenda Ward, of Pine River. This union, a son and daughter were born. His daughter preceded him in death 10 years ago. He had been ill for some time. He leaves to mourn his passing his wife and son, George, and four grandchildren, all of Backus. Also 41 nieces and nephews, and many great, and great great nieces and nephews. The out-of-town guests at the funeral were Mr. and Mrs. George Gilchrist and their two sons, Alvin and Delmer of Sobway, Minn.; Mr. and Mrs. Vanderhoff of Nisswa, and Lewis Gilchrist, also of Sobway. Source: Walker Pilot Newspaper, July 20, 1946. Note: 15 brothers and five sisters is a little much and I am not sure why these number were given in the obituary. Again the year of his birth changes. Charles Edward Spracklin is buried in the Bethlehem Cemetery in McKinley Twp., Cass County, Minnesota. Find A Grave has the cemetery listed in Pine River but is it pretty far from the town. I visited his grave in 2007 when I returned for the 3rd time to Pine River on a genealogical research trip. It took a bit of driving on country roads next to corn fields and going straight west into the sun from Pine River and then north to find the cemetery. Charles did not have a stone but he did have a small metal stake. I have added a memorial for him at Find A Grave. Arminda wanted to be buried in the mountains so she moved to Bozeman, Montana after Ed’s death. I visited Arminda’s grave site in the Sunset Hills Cemetery in Bozeman, I tried to locate a tombstone but there wasn’t one at the site. The following is a picture of me standing approximately where her grave is located in this cemetery. I wanted to pay my respects to her for writing the Spracklin Pedigree outline. 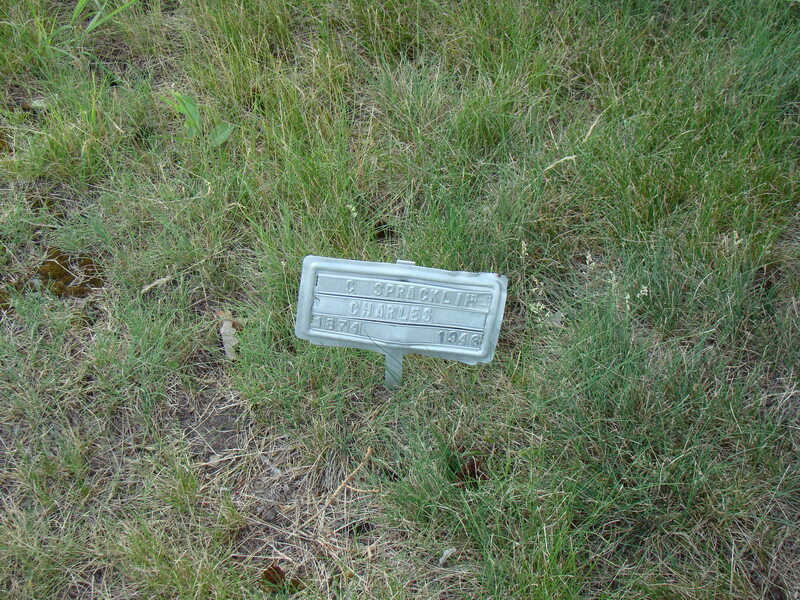 Arminda’s Grave in Sunset Hills Cemetery in Bozeman, MT. Source: Death Certificate for Arminda Spracklin, date of death 26 July, 1955. #130, Montana, Gallatin Co., died at the Bozeman Deaconess Hospital. Female, White, widowed, date of birth June 17, 1883, age 72 years, housewife, home, born New York, Mills, Minnesota, father unknown, mother Martha Walker, husband Charles Spracklin. Informant George D. Spracklin, cause of death heart failure with complications. Name of Cemetery Sunset Hills. etc. So it turns out that there were several Spracklins that migrated and lived in Minnesota.